Free Pony Ride for new families, visit this link for details! 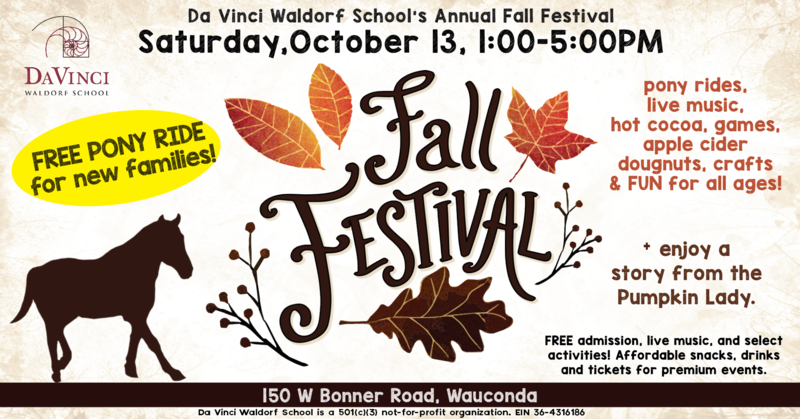 Come one, come all to our annual Fall Festival in Wauconda! Come celebrate autumn and enjoy the gifts of the harvest with the whole family. We’ll have pony rides, live music, food, games, apple cider, blacksmith demonstrations, crafts and more. Admission, live music, and select activities are FREE. Affordable food, drinks and tickets for premium events will be available. This event is truly fun for all ages! This event is open to the public! No R.S.V.P. required; come enjoy an afternoon of fun! Please visit our Facebook event to invite friends and neighbors or let us know you’re coming!